"Last Year in May I was 275+ lbs. I started struggling with my weight when we discovered I had a thyroid disease at the age of 16. Once they got my thyroid under control I had surgery on both knees in high school. At the end of high school I was weighing in at 195lbs. I never really bounced back after my surgeries. Once I hit college (USI) I was active by walking to and around campus every day and going to the gym. I didn't gain Freshman 15 until the next year which is when I started commuting back and forth to school from Tell City. With being on the road for an extra 3 hours a day I was already tired and I didn’t want to go to the gym during my breaks I just wanted to nap. It was so easy for me to grab some fast food for breakfast or dinner or even both (this happened every year from 2010-2015). In 2011, I found out that I was pregnant and I gained 45lbs. I reached 240lbs. I was exhausted. After I had Mallory I went back to school the next week. Talk about one stressed full time student and momma. In 2013, I was a full time student, mom, and started working during the school year. Then in the summer I kept 2 jobs. In fall 2014, I had to quit my job and focus solely on my last year of college. This was for sure my last year going, because if I didn't finish then I wouldn't have any finical aid to help me go another year. I wasn't happy with myself. I was stressed to the max. I was worried about graduation and getting all my classes taken care of. On top of worrying about graduating. I had a wedding to plan for fall 2015. To relieve some stress I would go to the gym or for a walk on my long breaks. In January 2015, I stepped on the scale and it read 275lbs. From then on I didn't step on the scale. I was stressed to the max trying to finish my last semester of college and planning for my wedding. I knew once I hit summer that I was well over 275lbs because I had to get 2 pant sizes up from the year before when I returned to Holiday World. I knew that I had to lose weight that summer so I could for sure fit into my wedding dress in September and then into my bridesmaid dress for my best friend’s wedding in December. I was tired, exhausted, and needed a boost. I had tried many different weight loss pills from doctors and direct sales. They would make me sick or just didn’t work. I finally found something and once I got some energy I was motivated to go on walks. I was back down to 270lbs by September! I was excited to hear that when my husband and I got married that I would get a free membership to EverBody's Gym since he works at Waupaca. I finally was able to start going to the gym! In March, I weighed at 262lbs. April is when I started my first season of the Biggest Loser! My first weigh-in was 256.6lbs. So far I am down to 243.8lbs. I have come a long way since last May! When I starting walking last summer I wasn't even able to walk without my knees and feet killing me. Finally I could walk a mile, but it took like 25 minutes. Since March, I am now able to jog a mile! I am very blessed be part of an amazing gym. 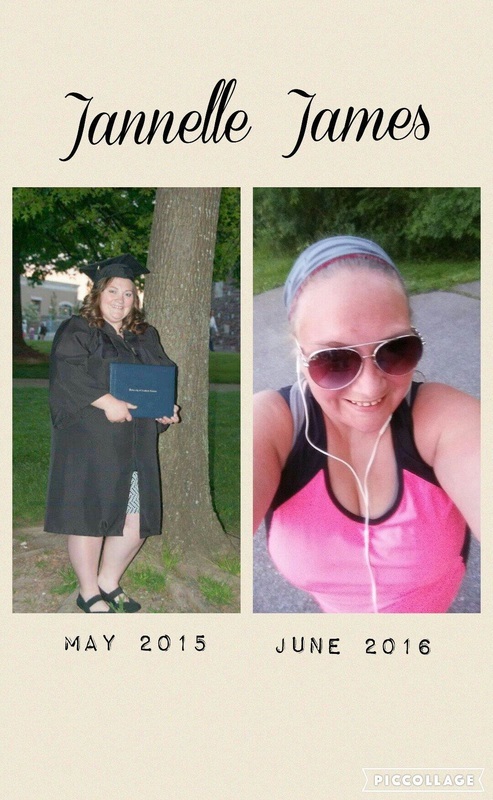 The Biggest Loser has helped me get out of my comfort zone! I am doing classes I never thought I would take, but now love going to them. My journey has only begun and I am eager to see where it’s going to lead me! "